The IL4-590 gene polymorphism has been shown to be associated with elevated levels of anti-Plasmodium falciparum IgG antibodies and parasite intensity in the malaria protected Fulani of West Africa. This study aimed to investigate the possible impact of IL4-590C/T polymorphism on anti-P. falciparum IgG subclasses and IgE antibodies levels and the alteration of malaria severity in complicated and uncomplicated malaria patients with or without previous malaria experiences. Anti-P.falciparum IgG subclasses and IgE antibodies in plasma of complicated and uncomplicated malaria patients with or without previous malaria experiences were analysed using ELISA. IL4-590 polymorphisms were genotyped using RFLP-PCR. Statistical analyses of the IgG subclass levels were done by Oneway ANOVA. Genotype differences were tested by Chi-squared test. The IL4-590T allele was significantly associated with anti-P. falciparum IgG3 antibody levels in patients with complicated (P = 0.031), but not with uncomplicated malaria (P = 0.622). Complicated malaria patients with previous malaria experiences carrying IL4-590TT genotype had significantly lower levels of anti-P. falciparum IgG3 (P = 0.0156), while uncomplicated malaria patients with previous malaria experiences carrying the same genotype had significantly higher levels (P = 0.0206) compared to their IL4-590 counterparts. The different anti-P. falciparum IgG1 and IgG3 levels among IL4 genotypes were observed. Complicated malaria patients with previous malaria experiences tended to have lower IgG3 levels in individuals carrying TT when compared to CT genotypes (P = 0.075). In contrast, complicated malaria patients without previous malaria experiences carrying CC genotype had significantly higher anti-P. falciparum IgG1 than those carrying either CT or TT genotypes (P = 0.004, P = 0.002, respectively). The results suggest that IL4-590C or T alleles participated differently in the regulation of anti-malarial antibody isotype profiles in primary and secondary malaria infection and, therefore, could play an important role in alteration of malaria severity. Anti-Plasmodium falciparum specific antibodies play a critical role in immune protection against asexual blood stages of the parasite, in which anti-P. falciparum IgG antibodies involved in reducing severity of the disease . In particular, the cytophilic IgG1 and IgG3 subclasses are considered to protect against P. falciparum, whereas IgG2 and IgM are not, and even suggested to block protective effects of the former Ig subclasses . 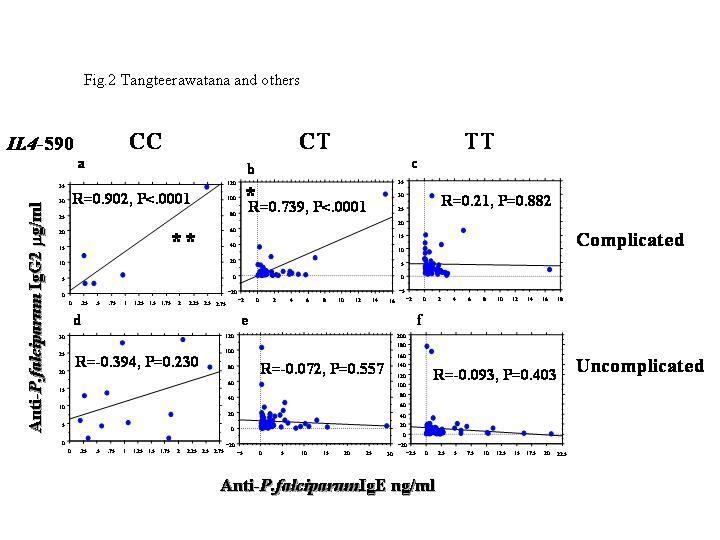 Anti-P. falciparum IgE, as well as total IgE antibodies, which are elevated in individuals exposed to malaria in Thailand, have been implicated to play a pathogenic role during malaria infection . In contrast, the anti-P. falciparum IgE levels in asymptomatic individuals in Tanzania were associated with a reduced risk for subsequent malaria disease . The regulation of antibody profiles in patients with complicated and uncomplicated malaria is still largely unknown. In both human and mice, different cytokines are thought to induce particular Ig isotypes. In humans, IL4 regulates B cells to express the γ1, γ2, γ3, γ4, α1, α2 and ε, germline gene transcripts (GLT) and to secrete the corresponding proteins [4–6]. IL10 promotes isotype switching from IgM to IgG1, IgG3, IgG4 and/or IgE [7–9] while IFN-γ promotes IgG2 [10, 11]. The inter-individual variation in cytokine production may be reflected by polymorphisms in regulatory region of the corresponding genes. The IL4-590 C/T transition in IL4 promoter was shown to influence the IL4 production as well as the elevated levels of total IgE [12, 13]. The IL4-590T allele corresponded to IL4-524T and IL4-589T alleles in an alternative numbering scheme [14–16]. In the Fulani tribe in West Africa, IL4-524T allele was found to be associated with the elevated levels of anti-P. falciparum IgG antibodies and protection against malaria , while IL4-589T allele was associated with the elevated levels of total IgE in children with severe malaria living in Burkina Faso . Conversely, total IgE levels were significantly elevated in children with cerebral malaria who carried IL4-590T allele and have been living in Ghana . Thus, the role of IL4-590T allele in regulating antibody profiles and malaria severity is controversial. In mice infected with Plasmodium chabaudi chabaudi, the specific IgG2a and IgG3 antibodies are predominant in primary polyclonal B cell activation. At that point, IFN-γ is markedly stimulated, while IL4 is moderately enhanced. In secondary IgG1-restricted response, only IL4 is produced . According to previous findings, the IL4-590 C/T polymorphism influences the balance between IL4 and IFN-γ and thus, could alter the severity of malaria . When the same sets of sera were used subsequently to determine the anti-P. falciparum IgG subclasses and IgE antibodies, the results showed different regulation in patients with complicated and uncomplicated malaria . Therefore, it is of interest to evaluate the impact of IL4-590 C/T single nucleotide polymorphism (SNP) on the production of anti-P. falciparum -IgG1, -IgG2, -IgG3, IgE antibodies and to determine whether such polymorphism and specific antibodies levels were associated with previous malaria experiences and clinical outcome of the disease in people living in a malaria endemic areas in Thailand. The same sets of patients previously reported were studied [18, 19]. Briefly, 110 and 169 patients with complicated (CM) and uncomplicated malaria (UCM), respectively, who had been living at Thai-Myanmar border in the west and Thai-Cambodia border in the east of Thailand; where malaria is endemic; were enrolled. These areas are considered as having low and seasonal malaria transmission. The annual malaria incidence rates in 2001 were 2 to 6/1,000 population . The two groups of patients were matched for age (P = 0.849), gender (P = 0.137) and nationality, i.e Thai, Burmese, Mon and Karen (P = 0.614). The median age was 25 years (ranged 14-67) for complicated and 24 years (ranged 13-65) for uncomplicated malaria. Based on the interview and clinical records, 27.3% of patients with complicated and 55% of those with uncomplicated malaria had previous malaria experiences. The number of previous malaria episodes in these patients varied widely, describing mostly 1-2 episodes of malaria (84/125), 3-8 episodes (27/125) and many episodes (12/125). However, the duration of malaria infection upon admission and the previous malaria episodes among patients were far different, varying from one month to more than 10 years (mostly between one month and two years). However, both groups of patients had acute malaria infection upon admission. Therefore, complicated malaria patients with or without previous malaria experiences (CME, CMN, respectively) and uncomplicated malaria patients with or without previous malaria experiences (UCME, UCMN, respectively) were identified. Clinical manifestations of complicated and uncomplicated malaria were defined according to World Health Organization criteria . Cerebral malaria was defined as unrousable coma with positive asexual forms of P. falciparum in blood smears, while other causes of coma were excluded. Severe malaria but not cerebral (non-cerebral severe malaria) was defined as patients exhibiting one or more of the following signs, hyperparasitaemia (>250,000 parasite/ml), hypoglycaemia (glucose <22 nmol/l), severe anaemia (haematocrit <20% or haemoglobin <7.0 g/d) or increased serum level of creatinine more than 3.0 mg/dl. The patients with complicated malaria comprised of all severe forms including cerebral malaria. Uncomplicated malaria was characterized by a positive blood smear and fever without other causes of infections and no manifestations of severe malaria as described. The patients were transported for admission to the Hospital for Tropical Diseases, Faculty of Tropical Medicine, Mahidol University, Bangkok. The study has been ethically approved by the Institute Review Board of the Faculty of Tropical Medicine, Mahidol University, Bangkok and the fully informed consent was obtained from all patients. Other details about the patients are delineated in Table 1.
a = Number of patients, b = Mann Whitney U or unpaired t test used for the analysis, c = Median, d = Percentages (in the parenthesis), e = Geometric mean/ml of blood, f = Mean ± SD, g = Percentages of individual with enlarged spleens and/or liver are in the parenthesis. *The Hemoglobin (Hb) variants includes HbE, HbF. NR = No report. Blood samples from patients with complicated and uncomplicated malaria were collected in EDTA sterile tubes before treatment on admission. The plasma and packed cells were separated and frozen at -20°C until use. Thick and thin films were made for microscopic examination after standard Giemsa staining. Parasite densities were determined by calculating P. falciparum parasites per ml of blood obtained from the number of parasites observed per 1,000 erythrocytes in thin film or per 200 leucocytes in thick film. The laboratory P. falciparum strain F32 was used to prepare the antigens for malaria antibodies detection. The late stages of P. falciparum infected erythrocytes were enriched by 60% Percoll and sonicated as described . 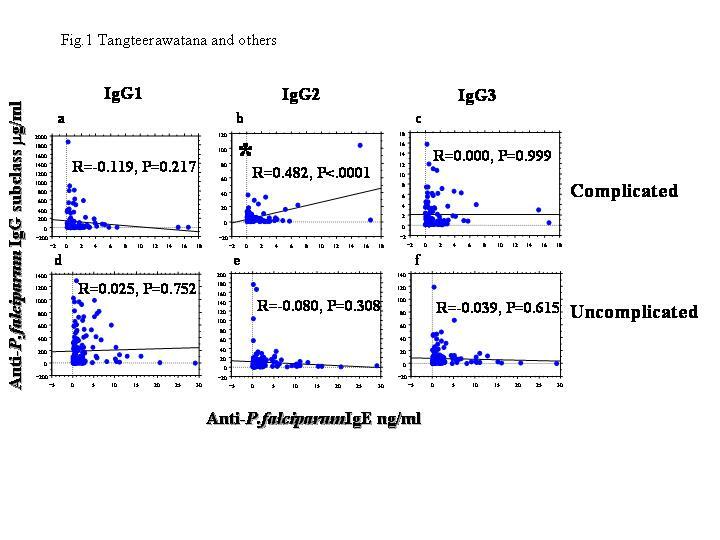 Anti-P. falciparum -IgG1, -IgG2, -IgG3 and IgE antibodies levels were determined by enzyme-linked immunosorbent assay (ELISA) as described previously  with some modification. The monoclonal antibodies used in the ELISA were given . Negative control sera were from Swedish donors who have never been exposed to malaria. DNA was extracted from buffy coats by phenol-chloroform extraction . Genomic DNA was used as a template for amplification by PCR and IL4-590 C/T polymorphism was detected by restriction fragment length polymorphism analysis as previously described . The data were analysed using SPSS or StatView computer software. The differences in characteristics of the patients with complicated and uncomplicated malaria were analyzed by unpaired t-test or Mann Whitney U test. The highest fever, haemoglobin, creatinine, and glucose levels between the two patient groups were tested by unpaired t-test, while the other characteristics were tested by Mann Whitney U test. The Chi-squared test was used to compare allele and genotype frequencies between the two patients groups. One-way ANOVA and unpaired t-test after log transformation were used to evaluate the significant associations between anti-P. falciparum IgG subclasses or IgE antibodies and the IL4-590 genotypes. The IgG subclasses and IgE were taken in the extreme 3 tiles. The genetic distribution of the IL4-590 genotypes between the low and high quartile was compared using Chi-squared test. A P-value of less than 0.05 was considered to be significant. Allele and genotype frequencies of IL4-590 polymorphism in complicated and uncomplicated malaria patients with or without previous malaria experiences. The anti -P. falciparum -IgG1, -IgG2, -IgG3 and IgE antibody concentrations in relation to IL4-590 genotypes in complicated malaria (CM) and uncomplicated malaria (UCM) patients are illustrated in Table 3. In complicated malaria, the levels of anti-P. falciparum IgG3 were significantly different among individuals carrying IL4-590 TT, CT and CC genotypes (P = 0.031), while the levels of anti-P. falciparum IgG1 tended to be significant among IL4-590 genotype (P = 0.095). To study the impact between IL4-590 genotypes on anti-P. falciparum IgG1 and IgG3 levels, the antibody levels in individuals carrying different genotypes were compared by TT to CT, TT to CC and CT to CC genotypes. As shown in Table 4, the anti-P. falciparum IgG1 levels were significantly different between individuals carrying TT genotype compared to those carrying CC genotype (median 18.04 vs 223.80: P = 0.025) and between individuals carrying CT genotype compared to those carrying CC genotype (median 24.12 vs 223.80, P = 0.037). In contrast, the anti-P.falciparum IgG3 levels were significantly different only between individuals carrying TT compared to those carrying CT genotype (median 0.51 vs 1.20, P = 0.030). When complicated malaria patients with or without previous malaria experiences (CME and CMN, respectively) were analysed separately, similar patterns were seen by the anti-P. falciparum IgG1 levels were significantly different between individuals carrying TT and CC genotypes (median 8.54 vs 223.80: P = 0.002) as well as between CT and CC genotypes (median 13.94 vs 223.80: P = 0.004). Interestingly, these observations were seen only in complicated malaria patients without previous malaria experiences. While the difference in anti-P. falciparum IgG3 levels between patients carrying TT and CT genotype tended to be significant in complicated malaria patients with previous malaria experiences (median 1.32 vs 5.62: P = 0.075). No such tendency could be observed in the levels of anti-P. falciparum IgG2 and IgE in complicated malaria patients either with or without previous malaria experiences. Among uncomplicated malaria patients carrying TT, CT or CC genotypes, the levels of anti-P. falciparum-IgG1, -IgG2, -IgG3 and IgE did not differ. Anti-P. falciparum IgG subclass and IgE levels (median) separated by IL4-590 CT genotype in patients with complicated and uncomplicated malaria (CM, UCM). in IgG subclass levels among the different genotypes tested with ANOVA. Anti-P. falciparum IgG1 and IgG3 levels (median) according to IL4-590 genotypes in complicated malaria patients with or without previous malaria experiences. a = Number of patients (in the parenthesis). Association between IL4-590 genotype and anti-P. falciparum -IgG1, -IgG2, -IgG3 and IgE low or high tiled levels in patients with complicated and uncomplicated malaria. N = Number of plasma for determining IgG1, IgG2, IgG3, IgE and genotyping IL4-590, # = Chi-squared test was used to test the difference of IL4-590 CC+CT and TT distribution between the low and high 3 tiles. * = μg/ml, ** = ng/ml, A = number of patients who carry IL4-590 CC genotype, B = number of patients who carry IL4-590 CT genotype, C = number of patients who carry IL4-590 TT genotype, D = Number of patients who had low, middle and high anti-P. falciparum -IgG1, -IgG2, -IgG3 and IgE levels. Association between IL4-590 genotype and anti-P. falciparum -IgG1 and -IgG3 levels base on previous experiences malaria infection in patients with complicated and uncomplicated malaria. a = Number of patients (in the parenthesis), # = Chi- squared test was used to test the difference of IL4-590 CC, CT and TT distribution between the low and high 3 tiles, * = μg/ml, A, B and C = number of patients with previous malaria experiences for determining anti-P. falciparum -IgG1, -IgG3 and carry IL4-590 CC, CT, TT genotypes, respectively. This study demonstrated that IL4-590 genotypes could differently regulate anti-P. falciparum -IgG1 and -IgG3 responses. The association between individuals homozygous for IL4-590 T alleles and the levels of anti-P. falciparum IgG3 was found only in patients who had previous malaria experiences with low levels in complicated malaria and high levels in uncomplicated malaria. When the differences in antibody levels between genotypes were explored, similar results were seen for anti-P. falciparum IgG3 in that complicated malaria patients with previous malaria experiences tended to have lower IgG3 levels in those carrying TT compared to CT genotypes. In contrast, the complicated malaria patients without previous malaria experiences who carried CC genotype had significantly higher IgG1 than those carrying either CT or TT genotypes. Thus, repeated exposure and host genetics, i.e the polymorphism of IL4-590 or other related genes has an impact on the modulation of antibody isotype profiles and altered clinical outcome. The relationship between IL4 polymorphism and anti-P. falciparum IgG subclasses antibody levels has not been studied thoroughly. This is the first finding to show that a single nucleotide polymorphism at position IL4-590 transition from C to T is associated with the levels of anti-P. falciparum IgG3 antibody in malaria patients. In complicated malaria especially those with previous malaria experiences, the levels of anti-P. falciparum IgG3 were significantly different among patients carrying IL4-590 CC, CT or TT genotypes. In particular, complicated malaria patients homozygous for IL4-590 T alleles and with previous malaria experiences exhibited significantly lower levels of anti-P. falciparum IgG3 antibody than their IL4-590 counterparts, whereas significantly higher levels were found in uncomplicated malaria patients homozygous for IL4-590 T alleles and with previous malaria experiences. Similar trends were observed for the anti-P. falciparum IgG1 in uncomplicated malaria patients with previous malaria experiences although this did not reach statistically significant differences. These results are consistent with the previous findings that low levels of IgG3 may lead to the onset of complicated malaria while high IgG3 antibody levels may protect against malaria [25, 26] and with the demonstration on the induction of CD40L stimulated naïve B cells by IL4 alone or in combination with IL10 to express IgG1, IgG2 and IgG3, but little IgG4 . IgG3 can activate the complement pathways  and co-operate through FcR receptors , thus, IgG3 could induce cell mediated lysis via complement pathways, phagocytosis and/or ADCI mechanism [2, 30] which are all known to facilitate parasite clearance. In fact, IgG3 may involve in anti-disease immunity by neutralizing parasite toxin, the glycosylphosphatidylinositol (GPI) membrane anchors of P. falciparum surface proteins and/or inhibiting cytoadherence of infected red blood cells, thus, interfering the parasite sequestration [31, 32]. In humans, IL10, IL21 are associated with IgG1 and IgG3 antibody production [7, 8, 33] while IL-27 is modest and regulates exclusively the production of IgG1 . Furthermore, the interaction and combination of different base changes at several sites in the promoter and/or the co-localized alleles of these cytokines and their signaling genes including the IL4-590 polymorphism may differ in patients with complicated and uncomplicated malaria and thus, alter the IgG1 and IgG3 production. This may also explain why different anti-P. falciparum IgG3 levels were observed only among patients with complicated malaria carrying IL4-590 TT genotype compared to their counterparts. The present study did not reveal any association between IL4- 590 C/T transition and the severity of malaria in either with or without previous malaria experiences, although there was an association between IL4- 590 TT genotype and the levels of anti-P. falciparum IgG3 antibody in both complicated and uncomplicated malaria patients with previous malaria experiences. The reason for this discrepancy is probably due to: firstly, the polymorphism itself may not be functional but act as genetic markers of other functional polymorphisms; secondly, the polymorphisms may directly regulate IL4 production only in the presence of other genetic determinants. In contrast to the results recently demonstrated in Mali of West Africa. The IL4- 590 T alleles were associated with the increased levels of both total and anti-malarial IgE in the Fulani, but not the Dogon. However, IL4- 590 polymorphism did not influence on the levels of anti-malarial IgG1-3 subclasses in both the Fulani and the Dogon . The reason for genetic disparities can be attributed to different ages, ethnicity, geographical differences, and clinical feature as asymptomatic and acute malaria infection. The IL4-590 C or T alleles in association with primary and secondary anti-P. falciparum - IgG1 and -IgG3 responses were different. The IL4-590 T allele was associated with anti-P. falciparum IgG3 levels in which the low levels were observed in complicated and the high levels were observed in uncomplicated malaria with previous malaria experiences. In complicated malaria with previous malaria experiences, the anti-P. falciparum IgG3 levels tended to be lower in patients carrying TT than those carrying CT genotypes. Conversely, the IL4-590 T allele seems to be associated with high anti-P. falciparum IgG1 in only uncomplicated malaria patients with previous malaria experiences, whereas, complicated malaria patients without previous malaria experiences who carried CC genotype had significantly higher anti-P. falciparum IgG1 than those either with CT or TT genotypes. Therefore, it is likely that T allele associated with secondary malaria infection, while C allele associated with primary infection. The shift of Ig-isotypes from primary to secondary responses has been demonstrated in mouse models to be correlated with the levels of either Th1 or Th2 cytokines . Th1 subset predominates in the non-specific primary response, whereas Th2 is the major activated pathway in the secondary specific response. As demonstrate earlier that the nuclear factor of activated T cells (NFAT) binding site at IL4-590 T creates a hair trigger for IL4 transcription, it is advantageous when a Th2 response is required, while IL4-590 C is favored when a Th1 response is required . Therefore, the modulation of Th1 and Th2 cytokines productions could have the impact on antibody classes and subclasses productions. It is possible that IL4-590°C or T in combination with previous exposure to malaria antigens probably partly modify the antibody isotype profiles and thus represent a wide spectrum of clinical symptoms. However, some of these observations need to be confirmed in a larger sample size in order to correct the confounding factors, such as age, number of previous episodes and parasite-virulence. This study showed that IL4-590 C or T is likely to play a modulating role in the regulation of antibody profiles in primary and secondary immune responses. The IL4-590 T allele participated in the regulation of anti-P. falciparum -IgG1 and -IgG3 in secondary infection, whereas IL4-590 C allele might participated in the regulation of anti-P. falciparum IgG1 in primary infection. In individuals carrying the IL4-590 TT genotype with previous malaria experiences, an increased risk of complicated malaria was associated with low anti-P. falciparum IgG3 antibody, whereas a lower risk was associated with high antibody levels. However, a panel of genetic variations in humoral immune responses and their related genes in larger sample size should be further investigated which may provide clue for better understanding in the alteration of disease severity. uncomplicated malaria patients without previous malaria experiences. We wish to acknowledge the contribution of Late Professor Sornchai Looareesuwan, Department of Clinical Tropical Medicine and the Hospital for Tropical Diseases, Faculty of Tropical Medicine, Mahidol University in providing blood samples and clinical data and his staff for their assistance in blood collection. We thank all patients for their kind participation in the study and Margareta Hagstedt, Stockholm University for her technical assistance. This study was supported by The Royal Golden Jubilee Ph.D. Programme (5 MMU44A1), the Basic Research Grant for the Royal Golden Jubilee Ph.D. (BGJ4580004) of the Thailand Research Fund (TRF), the Swedish Foundation for International Cooperation in Research and Higher Education (STINT), the Swedish International Development Co-operation Agency (SIDA/SAREC), the BioMalPar EU, #LSHP-CT-2004, 503578, Faculty of Tropical Medicine, Mahidol University and the Faculty of Medicine, Srinakharinwirot University. The present study was approved by the Ethical Committee of Faculty of Tropical Medicine, Mahidol University. SK and PT designed the study; PT prepared the blood samples, performed the IL4-590 genotyping and ELISA, collected clinical data, analysed statistics and drafted the manuscript; HP contributed to ELISA; MH assisted in IL4-590 genotyping; SK and MTB supervised the work, revised the manuscript and financed the research. All authors read and approved the final manuscript.